Last time we learnt about expressing restrictions and before that, we looked at exception and additions. As you may have realised from our past lessons, the adverbs of addition, exception and restriction (like also, even, only) often ‘focus’ their meaning on either a part of the sentence, such as a noun phrase or a verb, or the whole of the sentence following the subject. Depending on which element is ‘focused’ by such words, the sentence can be slightly ambiguous, so today we shall address the matter of ambiguity. Watch the accents in the following sentences - this is what makes all the difference in the meaning of the message. - also and too after it. Well, my friends, I hope you’re enjoying these little grammar sessions and I hope you’re finding them useful. Next time being the last issue written from Saudi Arabia, we shall tackle the last lesson in this part of communicative grammar, in which we dealt mostly with the concepts we need, in order to formulate our thoughts in writing or orally. The simple but very effective way to get a “buzz” started is to deliver excellent customer-focused content. Then seed your own word-of-mouth, link-earning buzz across a diverse range of sites. You need to build and nurture relationships with influential bloggers and site owners in your niche. Become a well-respected member of a niche-related forum. The primary motivation here is not just to earn a link. Think of it as networking, except instead of doing it at the golf course or over lunch, you do it via email or the phone. There are two aspects to "doing social" on your site -- passive and active. Both help bring traffic to your site by growing your reputation (and making it easier for visitors to help you grow it). Passive involves adding a mix of Facebook Like buttons and a Google +1 button to your site's pages, and Pinterest Pin It buttons to the best images on your pages. You can do all of that using Face It! and the social options available in SBI! You can also add Facebook Comments to your pages via Face It! This one is semi-passive. While visitors do the work of writing comments, which their friends will see in their Timelines, you have to moderate the comments. These passive social tools are so important for growing your reputation and receiving more traffic to your site, as they send traffic of their own via the links that your visitors display in their Timeline, tweet stream, etc. Second, all of these Likes, +1's, pins and follows are what are called social signals. The search engines are now using these to help determine where your pages should rank in the keyword search results they provide. Active involves your day-to-day participation on social media sites. Whether it's a Facebook business page, a Google+ business page, your Twitter account, or your site's Pinterest boards, you need to be actively engaging with the people who have found you there. A low level of engagement is worse than doing no active social at all, in terms of the signals it sends to the search engines and to your followers and fans. So it's a good idea to hold off on active social until you have the time and the motivation to do it well. This is where I am at this moment in time, but I am aware that I must not put it off indefinitely. In conclusion, we should maximize passive social on your site. It's a one-time setup, but starts building signals that will increasingly help over time. As time allows, start blending in active social channels. Game of the Week ~ Surprise, Surprise! Hang on in there, my friends, as it’s Quiz time! today… For a change, I shall challenge you to a little test this time, which is nicely put in the format of a game online. Do this, until you get the pronouns ‘she’, ‘her’, ‘hers’ and ‘herself’ well into your system. If you understand how this works, then you will also know how to deal with ‘he’, ‘his’, ‘his’ and ‘himself’ and others like this. 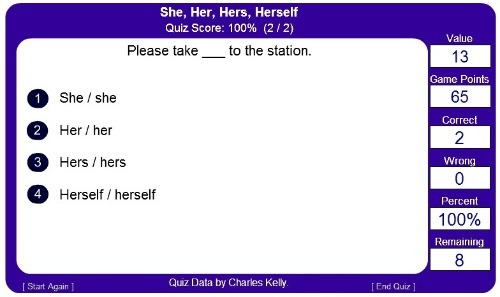 In this Quiz, you will have a sentence at the top, missing one word, and then the selection of ‘she’, ‘her’, ‘hers’ and ‘herself’ pronouns underneath, for you to choose the correct form. You can just click on it, or you may want to learn the following codes, for you to use your keypad instead. So, here it goes. It’s very simple: you have 10 sentences, each scoring 40 points, ideally. You are always given your most recent score and how many you got right or wrong so far. However, as you shall notice after a while, you may lose points even if you choose the correct answer. HOW? Well, if you need to think too much, the value of the answer will diminish. Note here, the value of this question is 13 by now… out of the total of 40 points. This will also be marked in the data you get after each of your choices, on the right side of your ‘game-pad’. At the end, you get your final score, together with the outline of how many you chose right and how many wrong. OK, play it until you get 100% about 3-4 times and I promise you – you will never ever have problems with these pronouns again!